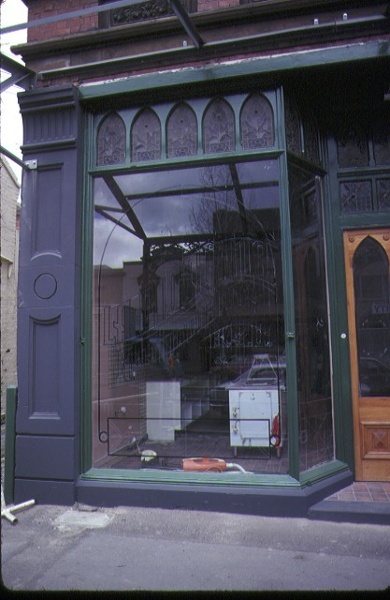 The building at 313-315 Drummond Street, Carlton was built in 1889 for Henry William Welch as a two storey commercial premises consisting of two shops with residences. The architects were Inskip and Robertson. The premises were immediately let to the recently formed Carlton Club under the presidency of J Gardiner, MLA for Carlton. The construction is brick with cement dressings on a basalt plinth. The main facade is symmetrical and dominated by a ground floor replica cast iron verandah and by the Gothic styling of the upper storey. Four pairs of round arched windows with polychromatic brick arches are divided by piers with a band of pressed cement decorative foliation at their base. The arches are framed by pointed arch drip moulds linked by gargoyle spouts. Beneath each window is a cement panel incorporating a decorative foliation pattern. Three cement roundels, each with a high-relief mask of a king?s head, sit in the spandrels between each pair of drip moulds. The cornice is bracketed. The parapet is divided by four piers, each with a grotesque on top. The identical and cleanly modelled grotesques are hybrids of a kangaroo and gryphon, each with three toes, a tail and carrying a shield. The central section of the parapet is slightly raised with plain pilaster decoration. The flanking sections of the parapet have a repeating trefoil motif. Despite being linked internally, the ground floor facade can be read as two shop fronts divided by pilasters. The two large panes of glass to each of the fronts are divided by a recessed doorway. Iron supports around each entrance are evidence of a previous shutter system. Above the main glazing is a frieze of pointed arches with leaded glass. At the rear is a Johns & Co cast iron spiral fire escape staircase of unknown date. 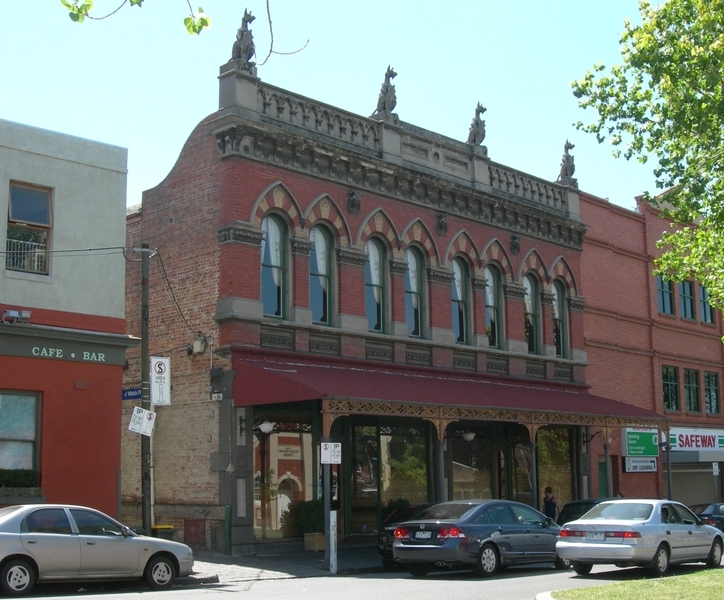 The building at 313-315 Drummond Street, Carlton is of architectural and historical significance to the State of Victoria. 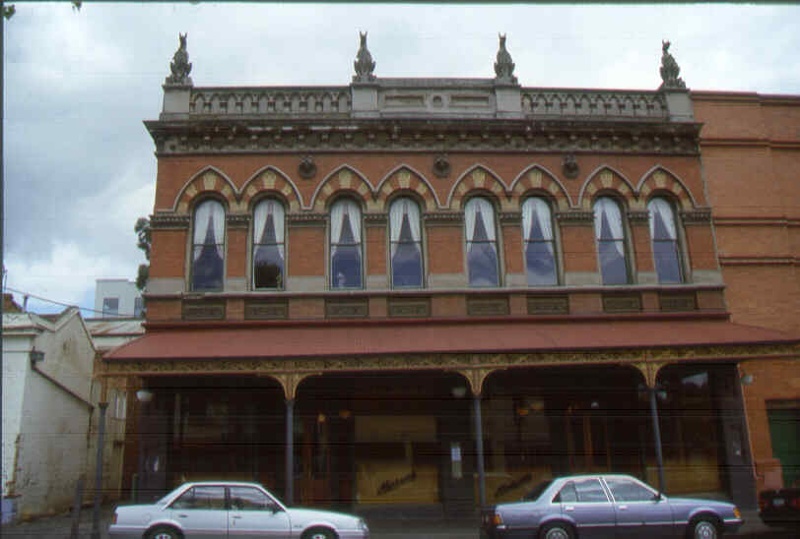 The building at 313-315 Drummond Street, Carlton is architecturally significant for its highly unusual grotesque Gothic facade. Contributing to this effect are the cornice and the parapet incorporating Gothic motifs, the chimera, the roundels incorporating high-relief masks and the original shopfront with a frieze of leaded glass Gothic windows over the main panes and matching Gothic style doors. The styling of the facade is reminiscent of the horizontal Gothic of Venice and deliberately alludes to the commercial prestige of that city. 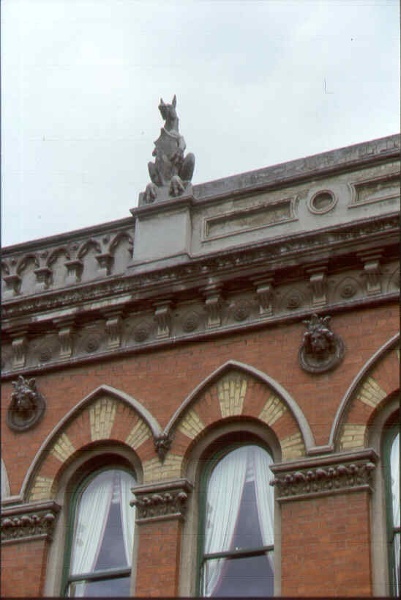 The kangaroo-gryphon grotesques on the parapet are highly unusual and distinctive. The proto-nationalist symbol, the kangaroo, has been medievalised. The grotesques anticipate a later general patriotic preference for the use of native animals as roofline decoration. Building, 313-315 Drummond Street, Carlton, Melbourne City Council. 1. All the buildings and structures being B1 Building, B2 Cast iron spiral stair as marked on Diagram 43 held by the Executive Director. 2. 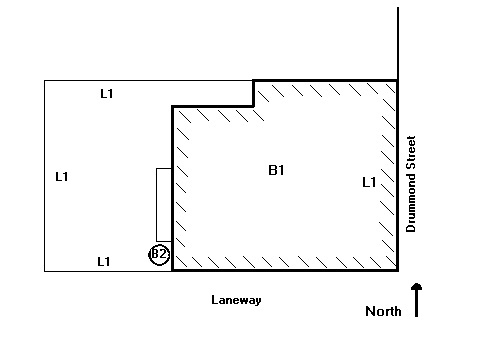 All the land marked L1 on Diagram 43 held by the Executive Director, being described in Vol. 8160 Fol. 879 and Vol.842 Fol. 865 being part of Crown Allotments 1 and 2, Section 42 at Carlton, Parish of Jika Jika. The architects of 313-315 Drummond Street was the partnership of Inskip and Robertson. George C Inskip was president of the Royal Victorian Institute of Architects on three occasions. Around the time of designing 313-315 Drummond Street the firm of Inskip and Robertson also designed the Convalescent Home for Women in Clayton Road, Clayton (1888), the National Bank at Kew (1891), the Union Banks at Smith Street, Fitzroy (1889) and Sydney Road, Brunswick (18901-91). The bank buildings were in the common currency of bank design at the time - palazzo style with overlaid trabeation and classical details. Venetian Gothic, the style of 313-315 Drummond Street, was for a brief time a popular style for commercial buildings. William Pitt designed three notable office block buildings in this style in the late 1880s: the Melbourne Stock Exchange, the Olderfleet Building and the Rialto Building. The building at 313-315 Drummond Street was erected in 1889 by the noted businessman Henry William Welch, a founder of the retail and drapery outlet Ball and Welch. On 28 July 1888 architects Inskip and Robertson called for tenders for the construction of shops and dwellings at Drummond Street. The accepted tender was from Bowness and Heath of Heidelberg Road, Fitzroy. The firm of Ball and Welch Limited was one of the most familiar in Victoria. 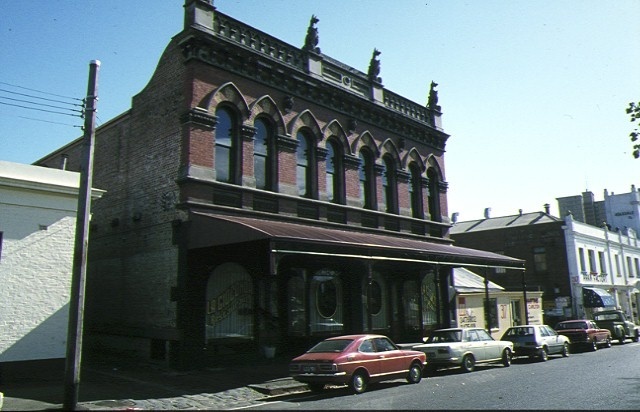 The firm was described by the Weekly Times as ‘…one of the finest and best known drapery warehouses in Australia.’ Ball and Welch moved to Carlton from Castlemaine in 1874. By 1896 they were employing 320 people. However, Ball and Welch do not appear to have ever occupied their new premises and it seems that the building was a speculative venture on the part of Welch, and it was always meant to be let as commercial premises. By 1897 the Carlton Club occupied only part of the building, sharing it with Goldman Ironmongers and a watchmaker, J Davidson. The premises continued to be operated as shops until conversion to a restaurant in 1989. The building demonstrates an early use of nationalist motifs. The hybrid gryphon-kangaroos on the parapet are highly unusual. The building is representative of late Victorian shop fronts, which are prevalent in the Calton area. It retains original exterior elements characteristic of commercial buildings including hinges for the original window shutters. The highly unusual decoration incorporating Gothic motifs and hybrid gryphon-kangaroo grotesques gives the facade a strikingly grotesque Gothic appearance. The horizontality of the design is also unusual for Gothic style in Victoria and is reminiscent of southern Gothic in Europe, of the horizontal Florentine style with machicolated cornices and Venetian windows. The establishment of the Carlton Club is significant as an expression of middle class affluence and business success in the Carlton area in the late 1880s. * All interior alterations, excluding works to the staircases and possible surviving late and plaster ceiling, provided such work has no effect on the exterior or structure of the building. The purpose of the permit exemptions is to allow works that do not impact on the significance of the place to take place without the need for a permit. The main facade, facing east, is integral to the significance of the building and should be preserved with all alterations subject to permit application. The interior has been substantially altered and makes understanding of the original layout, and subsequent changes, problematic. The twin stairs are the main surviving evidence internally. Therefore alterations to the interior, excluding structural alterations or works to the staircases, are permit exempt, providing there is no impact to the exterior. It is believed that the original lathe and plaster ceiling remains between the two floors and this must also be preserved. The surviving Johns & Co cast iron spiral stair should be retained.